Classes for children preschool through high school happen immediately following worship and are finished by 11:15am. Classes are held September through June. Child care is provided by a qualified staff person so that you may worship knowing that your little one is cared for in a loving environment. We are equipped with a pager system so that you can be notified how your little one is doing. For nursing mom's, we have a video receiver so that you can attend to your baby's needs, yet still see and hear what is going on in worship. Too old for nursery, but sitting through the full service is a bit much? Pre-schoolers and early elementary aged kids are dismissed from the worship for an engaging time of activities. 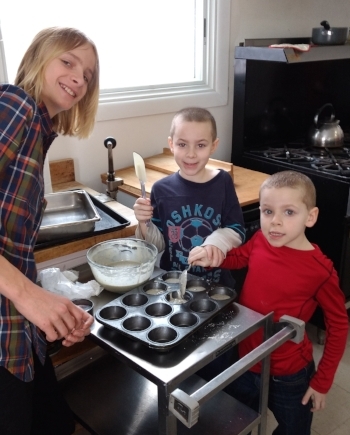 Once a month the kids are invited to be in the kitchen to make muffins to sell after worship during fellowship time. The money raised goes directly to one of the missions that we support.